Bob’s Juice Bar (15 rue Lucien Sampaix) is a lively, fast-paced vegetarian restaurant and juice bar where you dine at a communal table. Owned by an American, the place is genial and the food is delicious. Think tofu sandwiches, muffins, and futomaki. There is also Bob’s Bakeshop, which has sandwiches and homemade bagels. Two other good bets are Rose Bakery and Bread and Roses. Both serve very fresh food, much of it vegetable-oriented, in a casual atmosphere. The hip Eastside Burgers has vegetarian hamburgers and hot dogs. In the Batignolles covered market, there’s My Kitch’n. Gentle Gourmet Café: 24, rue de la Bastille, Tél: 01 43 43 48 49 – A purely vegan restaurant, located in the Bastille. Sol Semilla 23, rue des Vinaigriers, Tél: 01 42 01 03 44. Vegan restaurant with emphasis on “super” foods. 42 dégres Vegan restaurant focusing on raw foods. Vegan Follies: 53, rue Mouffetard, Tél: 01 43 37 21 89. Vegan cupcake shop on the rue Mouffetard. Loving Hut: 92, boulevard Beaumarchais, Tél: 01 48 06 43 84. Vegan and vegetarian foods. VG Patîsserie Végétale (Vegan pastry shop): Homemade croissants and other French pastries. Krishna-Bhavan and Saravanaa Bhavan: 24, rue Cail (10th) Métro: La Chapelle and 170 rue du Faubourg St. Denis (10th) Métro: Gare du Nord. Two Indian restaurants serving Thalis, Dosas, Pooris and other Indian favorites. Food is refreshingly spicy, which is not always the case at Indian restaurants in Paris. Not everything is vegetarian at Krishna-Bhavan, but there are many vegetarian options. Saravanaa Bhavan is completely vegetarian. Tien Hiang: Chinese vegan restaurant that with a large menu, food is tasty and freshly prepared with many mock meat options. Inexpensive. Maoz: 8, rue Xavier Rivas (5th) Métro: St Michel. Maoz is an international falafel chain has a take away stall in Latin quarter. (Check out my write up on Maoz.) Also try the rue de Rosiers (Métro St Paul) several options including, L’As du Fallafel. Ara: A vegan bean-to-bar chocolate shop with excellent chocolates. Wow, thank you, what a huge service! Now I feel encouraged to visit at some point, how exciting! So very thoughtful of you to make the effort to include the vegetarians ~ Mahalo! I’m traveling to Paris this summer with my family and would be interested in lists of vegetarian-friendly restaurants — we don’t want soy cutlets, but would rather places happy to make creative plates of their vegetable side dishes, interesting pastas, etc. Any recommendations? Cool list. Sometimes I wish I hadn’t cancelled my membership at the vegetarian’s club, which I was a member of for 6 years. It felt good to be able to say “No meat for me”. I love falafel, especially in a pita bread and with hot sauce, and Ayran on the side. Caroline: I would definitely recommend Mon Vieil Ami. The food is great and the focus is on vegetables. I’m a carnivore, but loved the article; lots of friends and family ask me. There are more options to find on the internet, but in France it’s very difficult to eat vegetarian! Sad because you can see what a really good cook is, when they cook vegetarian/vegan and even meateaters enjoy! I do believe it is changing, as in Germany too. So lucky that we stumbled upon your site.We will be in Paris this summer and seeking inexpensive vegi places to dine at.Thanks !!! On the high-end side, what about l’Arpege? 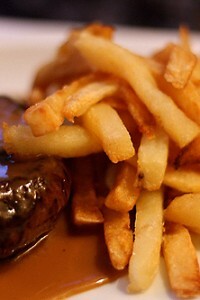 Chef Alain Passard removed all red meat from his menu and declared that he would focus on vegetables. Polly: The picture was from the Museé des Arts et Metier, although I got a better vegetable shot from Gideon. I think any of the 3-star restaurants, like L’Amboise and L’Astrance would be happy to prepare a menu without meat, with advance notice. Usually those places are pretty attentive. I have to weigh in and say that Le Potager de Marais is a place where I’ve had one of my worst meals in Paris – and tres expensive. On the expensive end, I agree with DL that L’Arpege, where I had the privilege of going last month, is 130 euros for lunch and ‘no meat!’ = ‘just lardon foam on the turnips!’ so one needs to be ignorant or vigilant in such a place. ;) Finally, there is another Tien Hieng in the 13th (I think it’s the same place, but might be wrong) that has some great options as well. Yes, a carrot and a cilantro leaf won’t suffice :) I’ve always wanted to visit Paris and wondered if I’d be able to survive as a Lacto Ovo Vegetarian. I definitely will refer to this compilation and the post from April 4th on Vegetarian Dining, thanks for posting them! I was a bit disappointed by Le Grenier de Notre Dame when I was there last October. It was very cute and cozy inside, and the food looked pretty – just most of it didn’t taste very good. If you eat cheese, Paris is easy as a tourist. Picnics for lunch. Crepes any time. Omelets for dinner are always a good option and available at just about any cafe. And of course, the Maoz falafel (and fries!). I had them in Paris, in Barcelona… and now am so glad they’ve come to NY. 1. All the way out in the 14th is a little place called Aquarius. They have nice veg versions on classic French dishes. I almost always get the potage of the day and grillote feuatilline followed by the delicious creme anglaise for dessert. 2. Maceo in the 1st does a really nice menu verte for vegetarians. We ate there for our birthday’s 2 Decembers ago and it was lovely. One of the things I might add is that it’s hard to get vegetables in restaurants in Paris because they take more time and manpower to prepare. Tipping a few kilos of green beans and cooking them takes lot more time, and money, than dumping frozen french fries into a fryer or boiling up some rice. Because rents and food prices are really high in Paris (and space is at a premium), low to mid-range restaurants are often void of fresh vegetables. 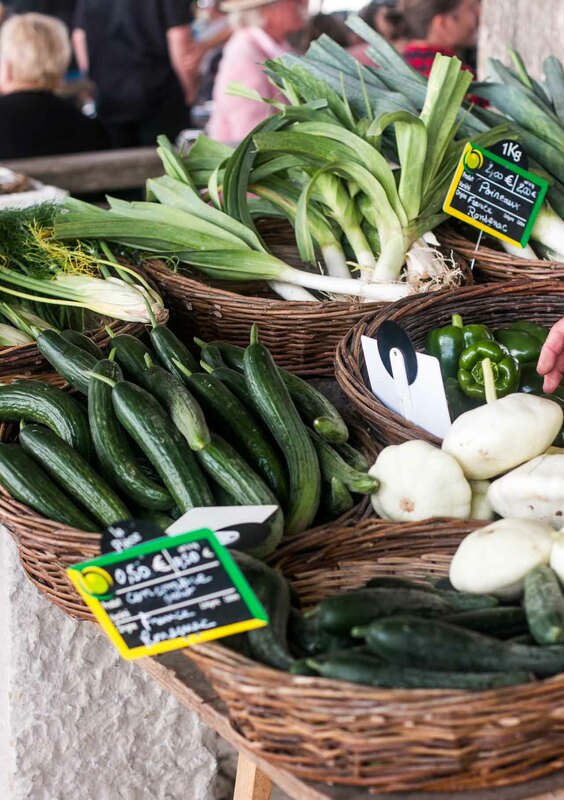 I do recommend hitting a market as much as you can for fresh fruits and vegetables and having a picnic, and most cafés will make you a salad…although don’t expect garden-ripe tomatoes or anything like that on it. If you see a salad of crudités on offer, that’s a plate of raw vegetables or vegetable salads, although they might be heavily dressed. I was researching organic restaurants in Paris when I stumbled on this fresh article. Service 12H00 – 23H30 non-stop, 7/7 ! Alexandre Kalisack naturopathe, proprietaire du magasin bio voisin a investi ce restaurant. Le phyto bar est actuellement le premier Bar bio Paris, en plus d’etre un restaurant. * deux plats du jour selon l’arrivage des produits entre 18 et 22euros. Thank you so much! I’ve lived in France as a vegetarian and I find it sometimes difficult, but not impossible. Then again, I’m easy to please and am happy to just have a green salad and some bread and chevre. It is nice to have this list, though, and I’ll bookmark for my next trip! Hi Signe: I love Lynne Rossetto Kasper and when we did a dinner for her book, The Splendid Table at Chez Panisse, she was one of my favorite author-guests. Thanks for the links. Just a reminder that there’s lots of other sites to check out over at my post Vegetarian Dining Tips In Paris, the list more vegetarian restaurants and other information for like-minded visitors to Paris. I just love the photo. It expresses how I felt when I was studying abroad in Paris as a vegetarian. and I will cook for a change. So thumb down for the veggy resto but a big UP for the markets. I am a vegetarian from Taiwan. 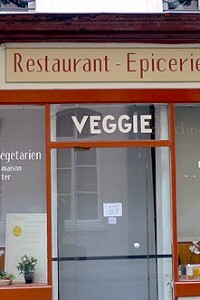 I used to visit Paris and found it was realy difficult to locate a vegetarian restaurant. Now, I am running a vegetarian website, VegTomato, http://www.vegtomato.org/, dedicated to advocate vegetarianism, I am wondering, if you would grand me the permission to translate this article and the other one, “Tips for Vegetarian Dining in Paris” into Chinese and post in my website to help those Chinese vegetarian to found a place to eat in Paris? I will link back to here, and credit it to you. A new restaurant is Vapeur Gourmande. They are offering only steamed cuisine. I find that it’s a good idea. hi Lisa: For kids, La Fontaine de Chocolat on the rue St. Honoré is fun, due to the chocolate fountain. And my favorite is A l’Etoile d’Or, which is the greatest candy shop in Paris. I’ve written it up on the site a while back, but I’m overdue for another visit…the Henri Le Roux caramels are the best! Another great veggie place is Bob’s juice bar in the 10th. They have a daily choice of salad, sandwich, soup, homemade granola, muffins or brownies and of course the best freshly squeezed juices in Paris. Beware though, the queue at lunchtime goes round the corner and if you get there around 3ish there might not be anything leftover. Thanks for showing La Victoire Suprême du Coeur, we ate there last night, and had a great meal. I have been vegetarian 36 years, and despaired of getting such high quality vegetarian food in France, but it was excellent. My wife had veloute of asparagus followed by mushroom roast, with coulis and three root mash, followed by raspberry and blackberry fool with chocolate truffles, and I had green vegetable ravioli, followed by mushroom and smoked tofu risotto. All of it was excellent. AND today we went to Alleosse and came back armed with bordiere butter, colommieres, comte and banon, fruit and baguette – my wife’s choice for her birthday lunch, great. Followed by raspberry and chocolate tart as a birthday cake, what could be better? Thanks for such a wonderfully helpful site. I’m wondering if soy milk is readily available in Paris cafes, or will I be laughed at? I’m lactose intolerant and am fond of my morning cafe au lait made with soy milk. If so, what is it called in French? Any advice would be greatly appreciated! Quyen: I don’t think any Parisian cafés carry soy milk so if that’s something you require, I’d find a way to unobtrusively bring my own. I would definitely second the recommendation for Maceo (http://www.maceorestaurant.com). I’m a life-long vegetarian but I don’t like exclusively vegetarian worthy whole-food type places. Maceo is an elegant Parisian restaurant that has a vegetarian Menu Vert with a choice in each of the courses. I’d recommend it for a special dinner. For more casual dining, I stick to Creperies or ethnic restaurants – Indian/Pakistani/Lebanese/North African. I find that cultures that have dietary restrictions of some sort are more understanding of vegetarians. Oh and Italian places for the pizza/pasta/vegetable dishes. Also, compared to my native London, I find the general quality of produce and preparation of food is far better in France. It can make up for the lack of choice on the menu. I feel like I have to post a comment about one of the restaurants mentioned. Like a poster above, the one meal I had at Le Potager du Marais was ghastly and very very expensive for what it was. I had a vegetarian friend in town, so I quickly looked around for something suitable but we were both really disappointed. The main courses were both boring and fried, and accompanied by deeply mediocre side salads with oil and vinegar left on the table for dressing! 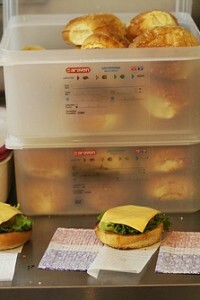 (No other restaurant in France would engage in such a lazy, unappetizing practice.) And it was NOT cheap. A racket, in my books. Hi Bertie: Thanks for the report. I haven’t been there (this is a guest post) but in general, the vegetarian restaurants in Paris aren’t as consistent as they are elsewhere. Some vegetarian friends of mine from Los Angeles were in town and went to a vegetarian restaurant…and there were no vegetables on the menu! Also, I should probably add that I’ve heard a few reports of bad service at Mon Vieil Ami, which I mentioned above. I haven’t been there in a while so I can’t say from personal experience if that’s true, but I thought it worth a mention. If anyone has an experience there, you’re welcome to post about it to confirm or deny. Thank you so much for this guest post, which was my introduction to your wonderful blog and which greatly enriched my week in Paris last September. I am also grateful to the posters who have given their recommendations. My husband and I tried two of the budget options above – Maoz and Tien Hiang. Both serve tasty, healthy food and are good value for money. Tien Hiang has a hole-in-the-wall atmosphere but, as it is packed with colourful characters and has friendly service, that is part of its charm. The green papaya salad helps to make up for the lack of fresh vegetables elsewhere, and that plus a main course and coffee cost us around 15 euros each. My omnivore husband was crazy about this place (as was I), and we ate lunch there twice in a week. We stumbled across Maoz by accident and ate there twice in the same day. I didn’t know falafel could be this good. We have also eaten at Grand Appétit on a previous visit. The place is very simple and the food a bit plain, but still tasty as well as healthy and inexpensive. The staff were kind and friendly, and we enjoyed the relaxed, no-frills atmosphere. I know, on our next trip we need to splurge a little and go to Maceo. Jane: I too, give high marks to Maoz. There’s not much room to sit but the all-you-want toppings (and hot sauce!) and friendly service make this a good bet in an otherwise touristy pathway. A few blocks away is Grom, which has amazing Italian gelato. The perfect dessert after a falafel! Great post and topic! Very helpful, even though I’ve been to Paris over a dozen times in the past few years. Green Garden has always been very nice and very fresh; a colleague once said it was the best meal she’d had all week — a bit of an overstatement but still one of my favorites although out of the way. Maceo has a nice menu vert and great wine list but both times left me just a little unsatisfied; I’m not sure why. Definitely worth a try, esp. with a mixed veggie/meat-eating group. Three of my favorites to visit with meat-eating colleagues that are decidedly not vegetarian but have always accommodated me well are Pasco (French, 7th), Le Troquet (French/Basque, 15th), and Il Vicolo (Italian, 6th). Finally, my two favorite veggie-friendly lunch places (apart from some of the above) are Rose Bakery (two locations, 3rd and 9th) and La Ferme (2nd — a semi-self-service place that is a great place to chill and not be bothered by staff when you just want to take a break). I just love the photo. It shows what its really like. I had so much trouble when I visited for 2 weeks.